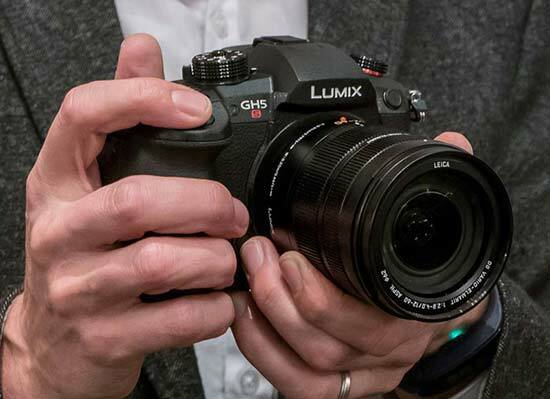 The Panasonic LUMIX GH5S is a new flagship compact system camera aimed firmly at videographers, sitting alongside the G9 and GH5 models. 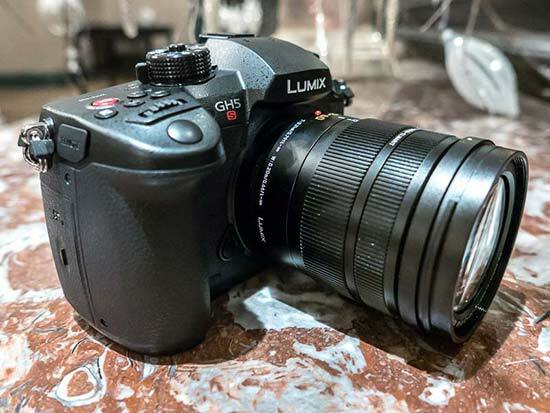 Whereas the recently released Lumix G9 is aimed at stills photographers and the popular GH5 at both stills and videographers, the new GH5s has been designed and developed for professional filmmakers. It features a brand new 10.2 megapixel sensor, 4K 60p / 50p video recording in Cinema 4K, internal 4:2:2 10-bit recording, Dual Native ISO Technology, Timecode IN/OUT compatibility, 14-bit RAW recording, true Multi-Aspect Ratios, and it ships with V-Log pre-installed (rather than being a paid upgrade, as on the GH5). At the heart of the Panasonic LUMIX GH5S is a brand new 10.2 megapixel High Sensitivity sensor, which promises to deliver the best video image quality ever in the history of LUMIX cameras. It can record Cinematic 4K movies at 60fps, the first mirrorless camera to do so, and there's also a 240fps full HD slow-motion mode. The main difference between the LUMIX GH5S and the GH5 in terms of video is that the latter can only record in C4K at 24fps, whereas the GH5S can record C4K at 25, 30, 50 and 60fps, which may or may not be a key difference for the videographers out there. Furthermore, the combination of the larger 1.96x pixel size and the innovative Dual Native ISO Technology which offers of two base ISOs of 400 and 2500 (as previously seen on the Panasonic EVA 1 professional Super35 4K cine camera). 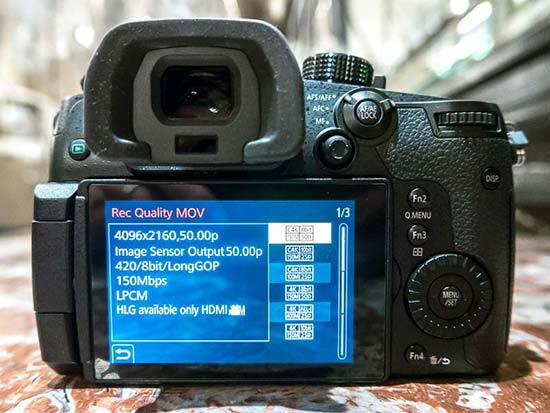 This system helps to ensure that images taken at ISO 800 and above have much less background noise than on a more conventional camera like the 20 megapixel GH5, which has a smaller pixel pitch and doesn't have the Dual Native ISO feature. The native ISO range of the GH5S is 160-51200, but this can be extended down to ISO 80 and up to 204800, a much bigger range than that offered by the GH5. You can set Dual Native ISO to either Auto, Low (ISO80-400) or High (ISO800-204800), giving you some control over when it is applied. The new GH5S can also focus in lower light than the GH5, down to -5EV from the GH5's -4EV. So if you do a lot of low-light shooting for stills or video, the GH5S is a better choice than the GH5. On the stills side, the Panasonic GH5s can now record 14-bit Raw files, the first time ever on a Lumix camera, thanks to its new sensor. The GH5 and even the recent G9 can only record 12-bit Raw files. The GH5S also has a true Multi-aspect Ratio sensor, much like the one on the LX100 compact camera, so that you can record both stills and video in the 4:3, 3:2, 16:9, 17:9 or 1:1 formats. Take a look at our huge gallery of full-size sample photos and videos taken with the Panasonic LUMIX GH5S camera. 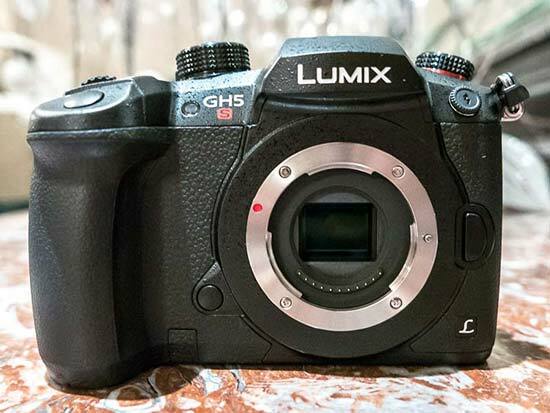 In terms of its external design and control layout, the Panasonic LUMIX GH5S is virtually identical to its sister camera, the GH5, which continues in the range. The only visual differences between them are the subtle red ring that surrounds the GH5S' shooting mode dial and its bright red movie record button. If you're a current GH5 owner or you've ever used a recent Panasonic mirrorless camera, then you'll quickly feel at home with the GH5S. 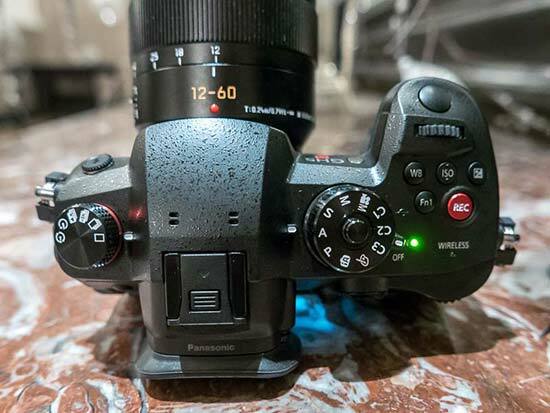 It also means that if you have already invested in Panasonic or third-party accessories for your GH5, you should be able to seamlessly use them with the GH5S too. The Panasonic GH5S is a pretty fast stills camera, offering 7fps burst shooting with Full AF/AE tracking for up to 60 JPEG / 14-bit RAW images, or 11fps with the AF/AE set at the first frame. The LUMIX GH5S features an impressive OLED electronic viewfinder with approximately 3,680k dots, a magnification of 0.76x and a 60fps refresh rate. It also has a vari-angle 3.2-inch LCD screen with 1620K dots on the rear, again exactly the same as on the GH5. The auto-focusing system in the Panasonic LUMIX GH5S is also the same as the GH5, with 225 contrast-detection AF points, 6 different AF modes, and the same AF speed of 0.05 sec (the recent G9's speed is an ever so slightly faster 0.04 sec). There are also 4 different Custom AF pre-sets available so that you can quickly switch between different AF methods to suit different subjects. One other minor improvement on the Panasonic GH5S is a slightly longer battery life of 440 shots (up from 410 on the GH5). Two things that the new Panasonic LUMIX GH5S doesn't have though, which the older GH5 does, are the 6K Photo mode, as unlike the GH5 it doesn't have an electronic first curtain shutter, and, perhaps most importantly of all, the lack of an in-body stabilisation system (IBIS) due to the new sensor. This last omission is definitely going to be a deal breaker for some would-be buyers, especially those who have already experienced the great IBIS system on the GH5. Check out our extensive hands-on gallery of photos of the Panasonic LUMIX GH5S camera. 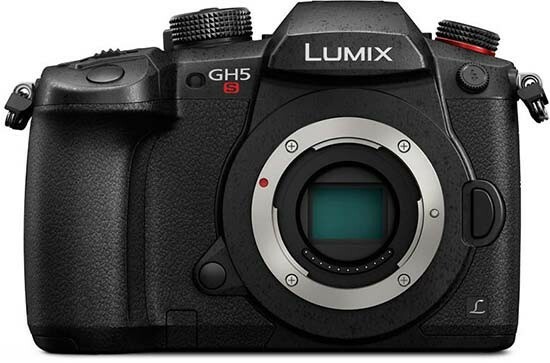 The new Panasonic GH5S joins the GH5 and G9 as the third flagship Lumix compact system camera. With the G9 focused on stills, the GH5 as a stills/video all-rounder and the GH5S on video, Panasonic certainly seem to have all the bases covered. The GH5S's body-only price of £2199 is £500 more than the GH5, though, which will probably make it a nicher product than the cheaper and arguably more versatile GH5, while the lack of built-in IBIS has already drawn a lot of criticism online. If you're primarily a videographer who does a lot of low-light shooting, though, the innovative GH5S could be a perfect fit, with the Sony A7S Mark II being the GH5S' main rival.